A centrifugal pump and centrifugal fan operate using one principle. They move fluid by creating differential pressure between their inlet and outlet with a spinning impeller. 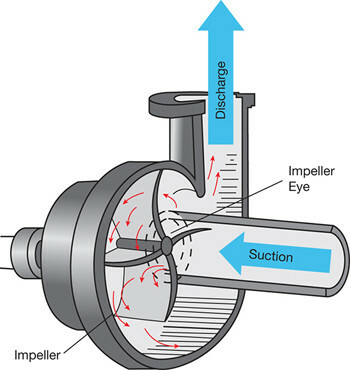 Fluid is drawn into the center (eye) of the impeller and pushed toward the outlet by the differential pressure created when the impeller spins. Affinity laws define how a centrifugal pump or fan performs from 0-100% speed. They calculate Flow, Pressure and Horsepower at various points on a centrifugal pump curve and a centrifugal fan curve. It’s tough trying to understand centrifugal pump or centrifugal fan curves, but Affinity Laws are simple. It’s difficult to visualize formulas so let’s look at the curves generated by them. When you see all three curves together the laws become clear and you see something unexpected. When motor speed is reduced, power is reduced faster than flow, so it takes less power per unit flow. The reduced power per unit of flow becomes energy savings when a Variable Frequency Drive (VFD) is used to reduce motor speed. This becomes significant as the motor size increases. 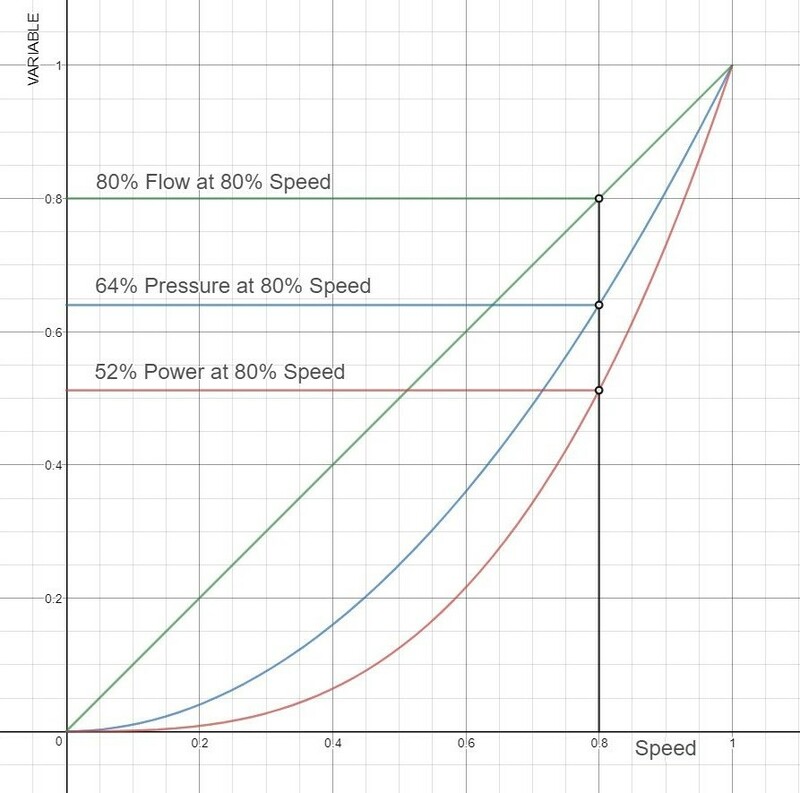 The chart belows shows at 80% motor speed, centrifugal pump flow is 80%, but the power is 52%. AS DESIGNED – When sizing pumps and fans Engineers typically oversize them by >20% for various reasons.